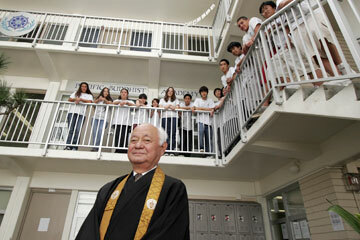 Bishop Chikai Yosemori stands in front of the Pacific Buddhist Academy at the Honpa Hongwanji Betsuin Temple in Nuuanu, the first Buddhist high school in the United States. Currently, 57 students are enrolled. The sound of chanting sets a serene scene at the Buddhist temple. But the low volume at the Honpa Hongwanji Betsuin Sunday services is not a thoroughly wonderful thing, since it reflects the diminishing energy of an aging congregation whose numbers are shrinking. Honpa Hongwanji Mission of Hawaii will sponsor an Aloha Banquet for Bishop Chikai Yosemori at 5:30 p.m. March 1 at the Hilton Hawaiian Village Coral Ballroom. Next Saturday is the deadline for reservations. Tickets are $60. Call Honpa Hongwanji headquarters, 522-9200, or write to execsec2@lava.net. The Hawaii Association of International Buddhists will sponsor a free educational series on "Exploring Buddhism" at the Honpa Hongwanji Betsuin, 1727 Pali Highway. » Thursday, 7 p.m. Buddhist teachings will be discussed by the Rev. Eshin Matsumoto, minister of Palolo Kannonji Temple, and the Rev. Alan Urasaki, chaplain at the Federal Detention Center. » Feb. 21, 7 p.m. Buddhist practices will be discussed by Dr. Thanh Huynh, Vipassana Meditation leader, and Lisa Waikalani, practitioner at Tibetan Meditation Center. » March 7, 7 p.m. "Buddhism in Society" will be discussed by Joanne Tachibana of SGI International and the Rev. 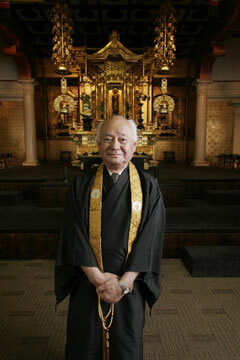 Yoshiaki Fujitani, president of the Buddhist Promotion Society. The good news is that it gets boomingly noisy on the grounds of the Pali Highway landmark on weekdays when students at the Pacific Buddhist Academy work to master the art of taiko drumming. Bishop Chikai Yosemori pins his hopes for regeneration of island temples on the high school, which will graduate its first class in May. "After I retire, I will try to make the high school stronger," said Yosemori, 75, who will step down at the end of the month as administrator and spiritual leader of the largest Buddhist sect in Hawaii. He has been bishop for 11 years and a Shin Buddhist minister for 42 years. The Honpa Hongwanji denomination has about 8,000 members and 36 temples in Hawaii, many of which were built in sugar plantation villages by early Japanese immigrants and serve tiny congregations. In common with several other Japanese-based Buddhist sects here, almost all the ministers called to serve Honpa Hongwanji temples still come from the old country. The goal of the academy, where "peace education" is integrated into the entire curriculum, is "to produce student leaders ... people who will think for themselves and care about other people's welfare," said the bishop. His hope is that some of those graduates will choose to become Buddhist ministers. The college prep school provides an academic education but also tries to instill in students the consciousness of being a peaceful person who knows how to relate to others in a peaceful way, to cooperate. Taiko drumming is a required class, said the bishop. "It is good to concentrate your mind, learn to work together, recognize differences and attain harmony. "Our religion emphasizes to know yourself well. If you know yourself, you can understand your life and, at the same time, commit yourself to seek spiritual value in your life. "Today, so many problems are caused by ignorance. We are attached to so many things; we value materialism. In this century we have to concentrate on how to control our greediness, our selfishness, and that applies to our food consumption, the environment, war, global warming." Half of the 57 students in the new school are not Buddhist. "Our way is not to convert," said Yosemori. "When people are interested (in Buddhism), we don't say, 'You must come to the temple.' Our way is the natural way. We try to convey who is Buddha by the way we live." Yosemori said, "Not many young people are coming to temples nowadays. Probably we aren't responding to young people's needs." That is an issue Buddhists have in common with mainline Christian denominations. And, as in the Christian world, it is new organizations that have created programs that interest outsiders who are curious about Buddhism. Bishop Chikai Yosemori poses in front of the altar at Nuuanu temple of the Honpa Hongwanji Betsuin, the largest Buddhist sect in Hawaii. The bishop is about to retire after 40 years as a minister. Alfred Bloom, Honpa Hongwanji minister and retired University of Hawaii professor, said the well-established sects have not capitalized on the boom of interest in Buddhism, which began a half-century ago in the West. "They don't think outward; it's all inward. They don't have a single program for outsiders. There's a downward trend in membership. We're losing numbers as people are dying off and very few are replacing them," Bloom said. Bloom said Yosemori was "a breath of fresh air," and credited him with generating unity within the denomination. He said Yosemori came with a broader perspective than most ministers because he was educated at a secular university, earning bachelor's degrees in literature and law from Keio University in Tokyo before seeking a master's degree in Shin Buddhism. Bloom said the bishop has charged ministers and lay members with getting involved in interfaith activities. "We've made a lot of progress since I started as a minister," Yosemori said. "We didn't have a dialogue with Christians, Jews and Islam. Now many see it is important." Of all the Buddhist sects, only Honpa Hongwanji is active in interfaith events, the legacy of former Bishop Yoshiaki Fujitani. Yosemori practices what he preaches. Last Thursday, he joined leaders of eight other faith affiliations at the dedication of the Counseling & Spiritual Care Center of Hawaii. Yosemori said dwindling membership in a sect does not mean the end of Buddhism. "In the history of the church, not every time prospers. It is up and down. Right now is a down time. If we make an effort, we can revitalize it. "What we try to do is maintain a church forever. If the church is seen as a place, it is harder to convey the teaching to people. Probably what will happen is that the nonsectarian kind of Buddhism will become more prominent." When the bishop is honored at a March 1 aloha banquet, he is likely to be applauded for establishment of the Pacific Buddhist Academy four years ago. He is happy that it happened on his watch. But, he said, "So many people made it happen. I am one person, and I did what I can."